Today I braved the horrendous downtown traffic (hah, nothing like Austin!) and checked out the Miramar, which according to some was originally named 'Sandy Retreat.' 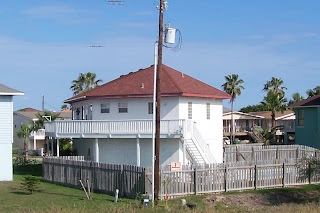 It was the first commercial hotel within town limits of what today is South Padre Island. I looked ahead, which had the signs, to the right which had some nondescript construction, and on the left were these cute little A-frame bungalows. They certainly looked old, anyway. 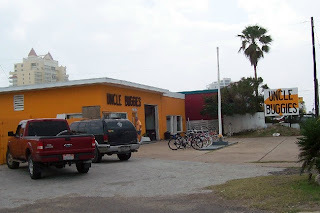 The orange building there is of course Uncle Buggies, a fairly famous dune buggy rental outfit in what looked like an old gas station. I was looking for the article about the owner who recently passed away, since he sounded like a very interesting person. With all the new regulations, dune buggies are now off limits in the dunes but you can ride along the beach in the northern county parts. 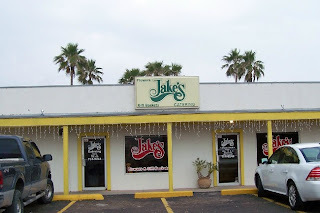 And this would be Jake's, reportedly another old jail, cop-shop, and town center. I shot the backside because the palms and sun looked better. Inside there is a very nice courtyard, almost Spanish style. 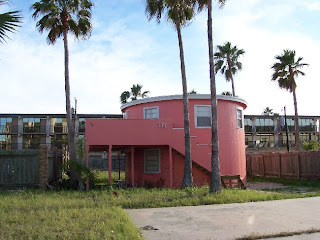 Here's another Island curiosity located near Gulf and I think Amberjack St., the "old brick house." Thanks to several of y'all for reminding me about this one. 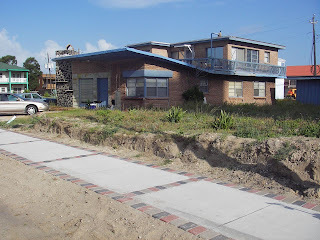 Again, we see some influences that could be considered "modernist" or just plain funky old beach house. The use of flying angles is impressive - a 45 degree side angle with a 3:12 roof pitch - no mere cubism here! The large chimney is also curious, though it adds much to its overall charm. Indeed, there are quite a few houses built on the Island that were designed "outside the box." There are hexagon houses, five-sided houses, an A-frame or two, and at least three geodesic domes. Even the rounded roof is evident today in some brand new construction, a rarity these days. Over the years there has been quite a discussion of which roof types are best in high winds of hurricane strength (> 74 MPH). One thought is that steeper roofs would not act as an airplane wing and thus incur less damage, although I can no evidence of this after a few tropical storms (knock on wood, none of true hurricane strength in the last few decades). You will note, however, that many put thought into angling the house aspect so the northeast side is the strongest, since that seems to be the prevailing direction during many tropical storms. In the abaove picture, the northeast is on the right-hand side of the picture. As such, the roof angle would be downwind and not scoop as much wind. Below, an asymmetrical house of five sides, facing towards the northeast. 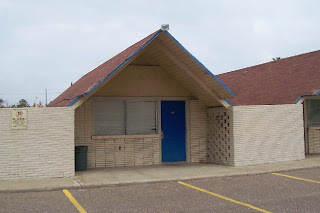 It is brick downstrairs and stucco upstairs.